Algebra is a proof-of-concept computer algebra system that displays each step in formula simplification, and can understand different input syntaxes. I wrote it in Christmas 2005 for the first Extend Firefox contest. plotting of functions including arithmetic operators (+-*/), powers (a^b, or a**b in some input syntaxes), square roots (sqrt), n-th roots (root), basic trigonometric functions (sin, cos, tan), integer and floating point numbers, and the numeric symbols π and ⅇ.
plots are exported to SVG and Postscript. It shares some code with Sentido, and I plan to combine them eventually. 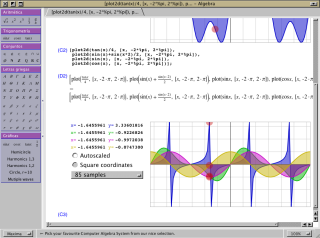 For now it is available here: algebra.xpi, just updated to work in Firefox 10. To start it pick the "Algebra" option in the "Tools" menu, or press Control+Alt+A, or in Apple computers ⌘+Alt+A.